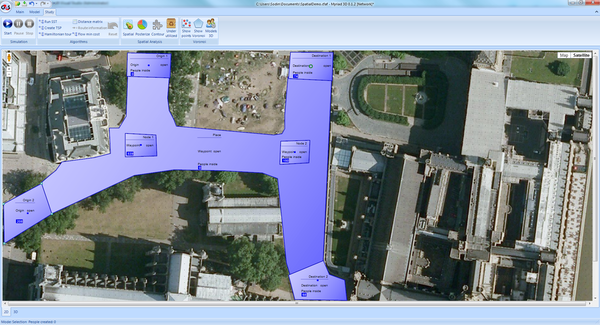 The spatial analysis tools indicate the space utilisation of complex environments (see PhD Thesis for details).�By coupling this type of analysis we can position elements in the design to optimise the use of the space. This provides us with several key metrics including footfall �predictions for�value/cost functions, risk (at high density�the red area have high risk) and long term wear and tear (using different wearing surfaces on key areas reduces costs). 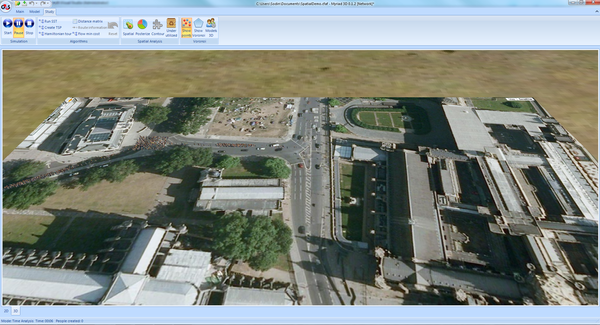 Above - screen image of the space we want to analysis (pedestrian/traffic interface). We define the Origins and Destinations, with the crowd flow rates over time. Below - we can add "rules" to the system (and obstacles) so the agents navigate the terrain (models are surface following). The agent based models integrate with the risk analysis and value engineering models. Complex pedestrian environments can be constructed, analysed,�modified, enhanced with "rules" (such as keep left) and objects (furniture etc). The results can be compared before/after changes for value engineering and space utilisation. Below is an example of a concourse project (Sydney CBD train station) where the quality of space and value engineering were assessed in the system. Over the last year I've rewritten to core algorithms for spatial analysis modelling - which now uses a single pass process with weighted Origin and Destination. 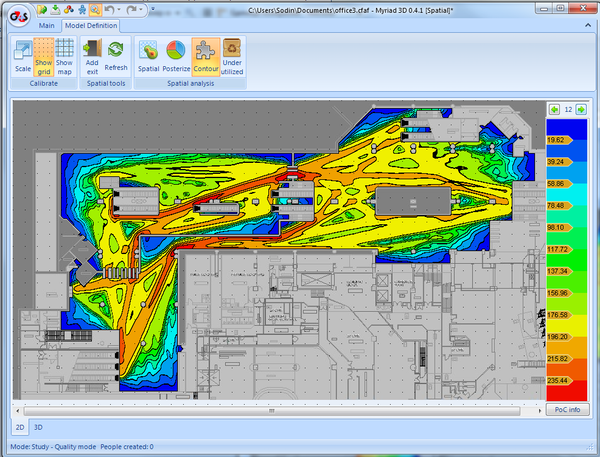 This allows a much faster analysis from CAD plans.